Dharamsala : On behalf of Tibetan Parliament-in-Exile, Mr. Pema Jungney, who sworn in this morning as the new Speaker of the 16th Tibetan Parliament-in-Exile offered his condolence to the surviving family members of Hon. Late George Herbert Walker Bush, 41st President of the United States, who passed away late Friday night. In the condolence, New Speaker lauded him on his honorable services and considerable contributions to the growth of the United State and for engaging in humanitarian activities even after his retirement. He wrote: ”He was the first President of the United State met with His Holiness the 14th Dalai Lama and has continuously raised voice against the human right violation inside Tibet. Furthermore, he persistently urged Chinese Authorities to resume the dialogue between the Chinese Government and the representatives of H.H the 14th Dalai Lama, for which we are eternally grateful and remain indebted”. He concluded the letter remembering the resolute support extended by him and his entire family in the history of Tibetan struggle and offered his solidarity with the family members at this sorrowful time. 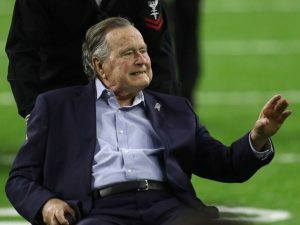 The late Late George H. W. Bush was 94 years old and was the longest-lived American President in history of the United States.